Dawn comes at sea while Pegasus was positioned just south of Gulfport, Miss. Pegasus arrived off the Port of Gulfport, Miss., early this morning at about 7 a.m. CDT, but was asked to remain at sea and await passage of a Gulfport-bound freighter, the Bernado Quinnada, flagged in Nassau. While waiting at sea, Pegasus was passed by no less than the freighter, a Coast Guard cutter, six shrimp boats and several barges hauling fuel and grain. A very busy crossing here at Gulfport. Once cleared to enter port, Angelica E and Emmett Eymard fired up their engines and towed Pegasus into port for a fast transfer to the Liberty Star. Upon entering the port proper, Pegasus was turned completely around facing south out of the port. The blogging passengers, Mick Speer and myself, were quickly shifted from Pegasus to a local pilot vessel and then just as quickly were placed on board the Liberty Star. Introductions went fast as the crew bent to the job of hooking up to the bridle of the Pegasus with the tow line, an evolution that was completed in only a few minutes by the obviously veteran and experienced crew. Able Bodied Seaman John Jacobs of Cocoa Beach, Fla., right next to Kennedy Space Center, performed the all important task of attaching the Pegasus bridle to the tow line of the Liberty Star. “This particular operation to secure the Pegasus bridle and Liberty Star tow line went like clockwork. It was a normal and well done hookup performed by a very experienced group of seaman,” said Jacobs. Liberty Star is several miles out of Gulfport now, heading south toward the channel between West Ship Island and Cat Island — outbound for the Gulf of Mexico. Immediately upon leaving Michoud Assembly Facility this afternoon, we entered the Intracoastal Waterway and headed for Gulfport, Miss. Two commercial tug boats hooked up our tow from Pegasus and without fan fare we were off on the first leg of our trip to the Kennedy Space Center. We headed east in the somewhat confined limits of the waterway in about 15 feet of water and took in the local sights along the banks. I’ve crissed-crossed the Intracoastal Waterway almost all my life, but until now I’ve never traveled along it; another first for this trip. The Intracoastal Waterway is a 3,000-mile waterway along the Atlantic and Gulf coasts of the United States. Some lengths consist of natural inlets, salt-water rivers, bays, and sounds; others are man-made canals. It provides a navigable route along its length without many of the hazards of travel on the open sea. If you’ve been a tourist in Texas, Louisiana, Mississippi, Alabama, Florida, the Carolinas, Maryland or Virginia, you’ve crossed the waterway many times. The waterway runs for most of the length of the Eastern Seaboard, from its unofficial northern terminus at the Manasquan River in New Jersey, where it connects with the Atlantic Ocean at the Manasquan Inlet, to Brownsville, Texas. The creation of the Intracoastal Waterway was authorized by the United States Congress in 1919. It is maintained by the United States Army Corps of Engineers. Federal law provides for the waterway to be maintained at a minimum depth of 12 feet for most of its length. The waterway consists of two non-contiguous segments: the Gulf Intracoastal Waterway, extending from Brownsville, Texas to Carrabelle, Florida, and the Atlantic Intracoastal Waterway, extending from Key West, Florida to Norfolk, Virginia. The Intracoastal Waterway has a good deal of commercial activity; barges haul petroleum, petroleum products, foodstuffs, building materials, and manufactured goods and it seems space ships, as well. It is also used extensively for recreation. Numerous inlets connect the Gulf of Mexico with the Intracoastal Waterway. 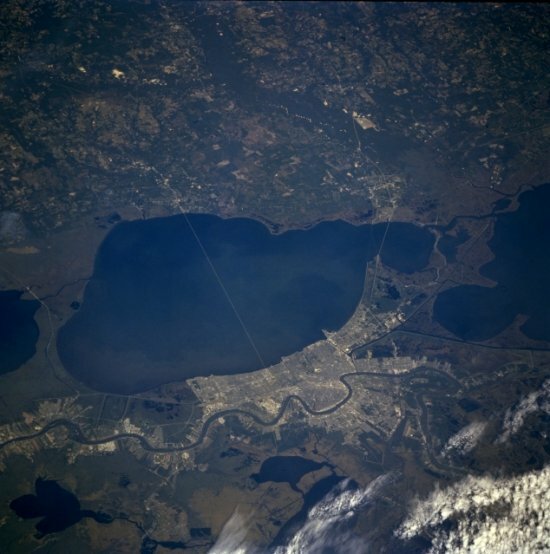 Early in our trip we pass two waterways known as passes or inlets that intersect the Intracoastal Waterway and connect the Gulf and Lake Pontchartrain. Each of these waterways has its own silent guardian. The first pass is Chef Menteur Pass, a short water route connecting the Gulf of Mexico to Lake Pontchartrain. An earlier fort at the site was called Fort Chef Menteur. The current brick fort was built in 1822, and renamed “Fort Wood” in 1827, and renamed again, Fort Macomb in 1851. Both forts were envisioned to keep pesky enemy fleets out of Lake Pontchartrain and hence the shores of New Orleans. The fort was occupied by Confederate troops early in the American Civil War, and taken rather quickly without a fight by the Union in 1862. The fort and its land are now owned by the State of Louisiana. The similar three sided, but better preserved Fort Pike is situated some 10 miles away at the Rigolets Inlet and is open to visitors. Leaving the confines of the narrow waterway we pass into the Mississippi Sound. The Mississippi Sound is an open body of water that runs east-west along the coast from Waveland, Miss., to the Dauphin Island Bridge , Ala., a distance of about 90 miles. We will travel only about half that distance in the Sound. The Sound is bordered on its southern edge by the barrier islands — Cat, Ship, Horn, Petit Bois and Dauphin Islands — which are part of the National Park Service’s Gulf Islands National Seashore. Those islands separate the sound from the Gulf of Mexico. Large portions of the Mississippi Sound reach depths of about 20 feet. Part of the Gulf Intracoastal Waterway traverses the sound with a project depth of 12 ft. The waterway, maintained by the U.S. Army Corps of Engineers, is designed for towboat and barge traffic. Most of its route through the sound is merely an imaginary line through water whose depth exceeds the project depth. 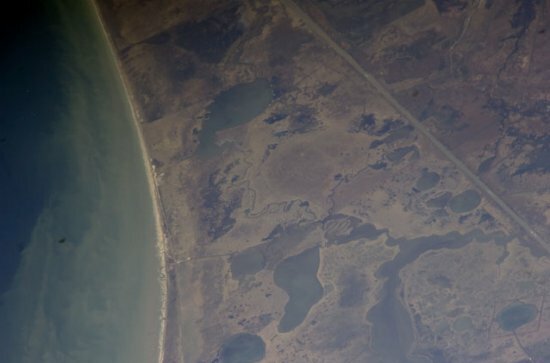 A section west of Cat Island and the portion north of Dauphin Island rely on dredged channels marked by aids to navigation maintained by the U.S. Coast Guard. Deepwater ports along the Sound include Gulfport, Miss., and Pascagoula, Miss. Dredged ship channels running basically north-south connect those ports to the Gulf of Mexico, running between pairs of the barrier islands. In the summer of 2008, I stopped by the Port of Gulfport to observe the transfer of Pegasus from the tug boats to the Liberty Star. The transfer went much faster than I anticipated, taking only about 20 minutes. Before I could count to 100, Liberty Star had snagged the tow from the commercial tug boats and was chugging out of port into the Mississippi Sound and on to the Gulf of Mexico. 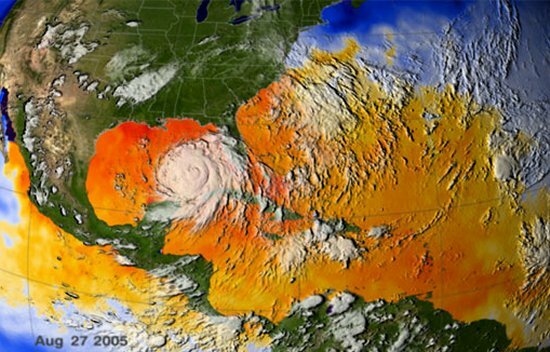 Whereas New Orleans was essentially brushed by Katrina in 2005, the Port of Gulfport was hit head on. The storm surge in the Gulfport area was relentless, 20 feet above normal sea levels and pushed well inland taking everything in its path. The Port of Gulfport lost warehousing and hundreds of sea-land vans filled with poultry and foodstuffs. So much salt water was deposited inland that it destroyed a large swath of Mississippi forest; so much so, that the loss of forest in Mississippi is one of the largest in the history of our country. During my 2008 visit to Gulfport I stayed overnight at the Marriot Hotel across the street from the Port of Gulfport. During breakfast the hotel master cook came out to talk and ask how we had liked our meal. The meal was great. I learned the cook had lost her father to Katrina and our waitress had lost her husband — both from broken hearts after Katrina. They were not among the 2,000 Katrina victims, but they should be. 9:55 a.m. — Pegasus Just Outside of Gulfport, Miss. Pegasus passed south of Cat Island around 6:30 a.m. CDT, having crossed the Mississippi Sound at about five miles per hour. Currently waiting to enter the Port of Gulfport, Gulfport, Miss. Skies are clear and the morning air is quite brisk. Lead crewman Rick Gager believes we will arrive at the port at approximately 10 a.m. CDT.